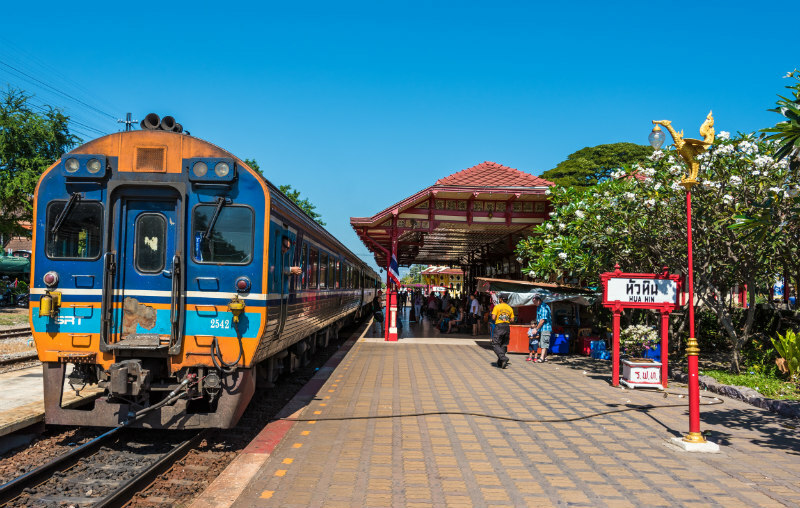 Built during the reign of King Rama VI, and only a short distance from the centre of town, Hua Hin’s railway station and adjacent royal waiting room are undeniably attractive. The brightly painted wooden buildings that are Thai in concept and design somehow manage to have a ‘Victorian’ feel to them. The story about the birth of Hua Hin as a royal seaside getaway town would be incomplete without a mention of this historic railway station. 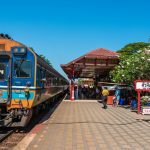 Back in the early days, there was no road access to this idyllic beach town, and train travel was a new and delightful alternative to get from Bangkok to Hua Hin instead of by boat. 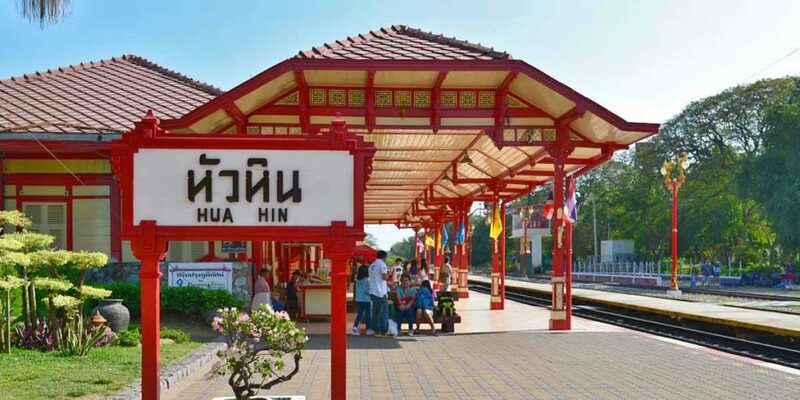 A Brief History – The Birth of Hua Hin With the train station in place and the northern-southern rail line connecting Bangkok and as far south as Singapore in 1921, the town was gradually built around it. 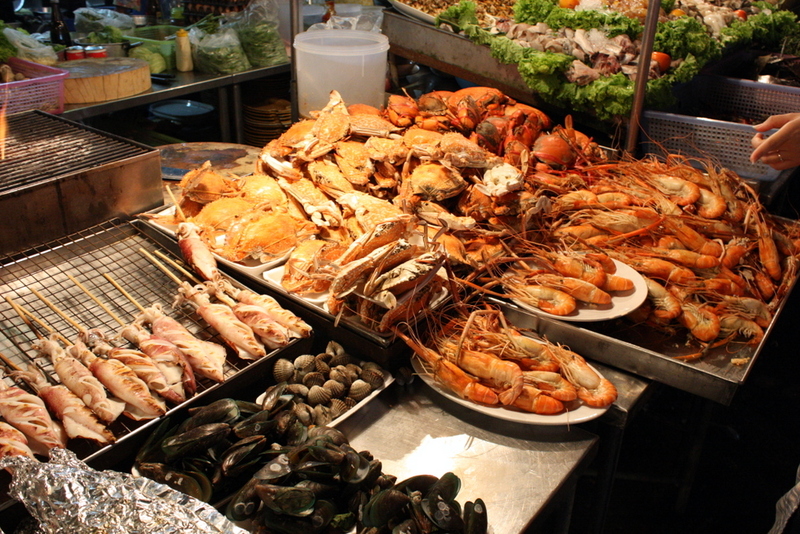 European expatriates would travel from Penang and Singapore to enjoy a seaside vacation in Hua Hin. A road was constructed from the train station to the beach where the town’s first luxury hotel – The Hua Hin Hotel Siam – once stood. The hotel, designed by Italian architect A Rigazzi and operated by the Royal Siamese Railway (RSR), has two storeys and boasts elegant colonial-style architecture with verandahs on either side. Today, it has become part of the Centara Grand Beach Resort & Villas Hua Hin and Hilton Hua Hin Resort & Spa. By 1926, Hua Hin was pretty much set to be a popular seaside town, complete with the train station, luxury hotel, two royal palaces (Klai Kang Won and Maruekhathaiyawan) and a nine-hole golf course (laid out in 1921). Embark on a Historic Journey Today, the train station has become a popular tourist attraction. Its quaint, East-meets-West architectural style stands in stark contrast to the modern hotel buildings and outdoor malls that have become an integral part of 21st century Hua Hin’s skyline. Relive the splendour of Hua Hin’s past by combining your visit to the train station with Maruekhathaiyawan Palace, also fashioned in similar style with open verandahs, covered boardwalks and beautiful fretwork details. 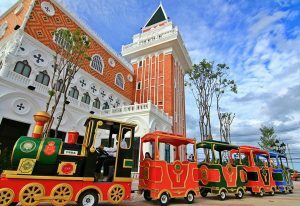 Better yet, relive the past and take the train from Bangkok to Hua Hin, a journey that takes about four hours compared to 2.5 hours by car. 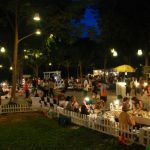 Cicada Market is all about art, handmade crafts and good times. 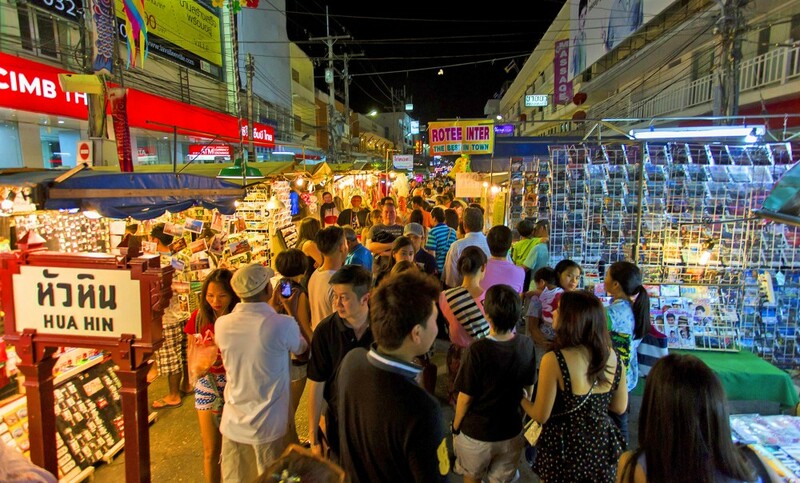 With an open-air market concept, it brings together Hua Hin’s artistic talents and those who wear ‘freedom of expression’ on their sleeves. 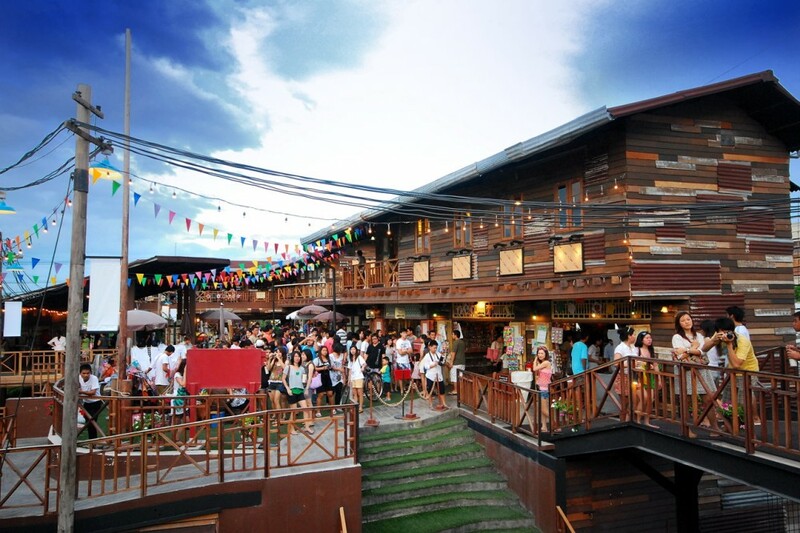 Besides the crafts market, you’ll also find an art gallery, beer garden and live music. 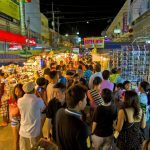 Open only on weekend evenings, the market is usually packed with weekenders from Bangkok. 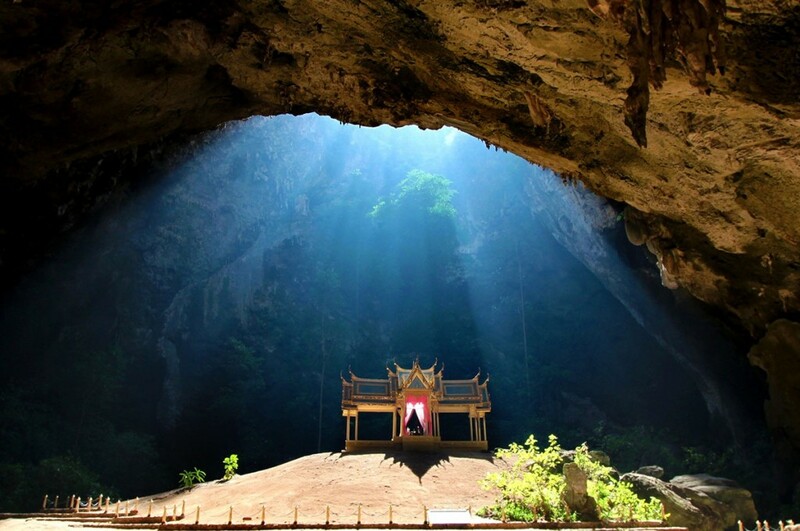 It is located on Phetkasem Road, about halfway between Hua Hin town and Khao Takiab. 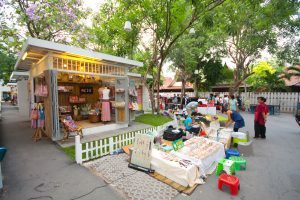 Cicada Market – Hua Hin’s Art Market The market has four sections: Art a la Mode, Art Indoors, Art of Act and Art of Eating. Art a la Mode occupies the majority of the outdoor space and is dedicated to clothes, decorative items, home wear, and handmade accessories. Art Indoors is situated in the art gallery where the bulk of painting, sketches and sculpture are for sale. Housed inside the same building as the art gallery are a handful of shops selling creative knick knacks and souvenirs. 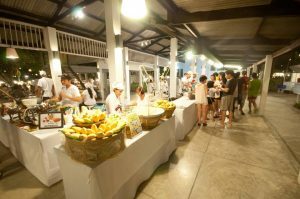 Art of Eating, an open-air food court, enjoys an idyllic garden setting. Find all kinds of savoury snacks, sweets, salads, deep fries, stir fries, all the way to steaks, pastas and seafood barbecues. 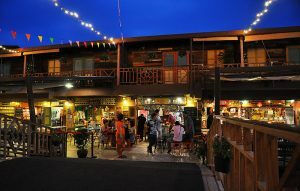 A separate bar and beer garden offers a good selection of alcoholic drinks. 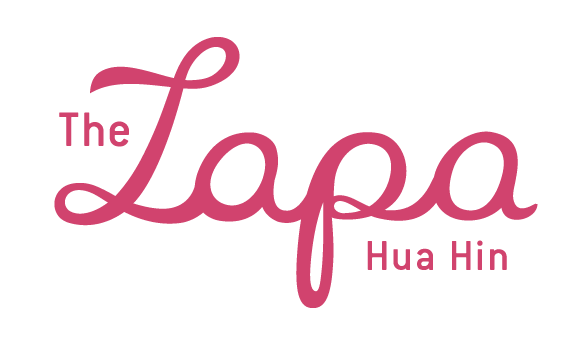 Live Music and Shows at Cicada Market Part of Cicada Market’s philosophy to help promote Hua Hin as an art destination, Art of Act provides a platform for local art groups to express their talents and creativity. 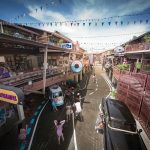 The market’s open-air amphitheatre has seen performances by Hua Hin’s Sasi Dance Group, B Boy, pantomime, music bands and invited artists from Bangkok, such as Koh Mr. Saxman. 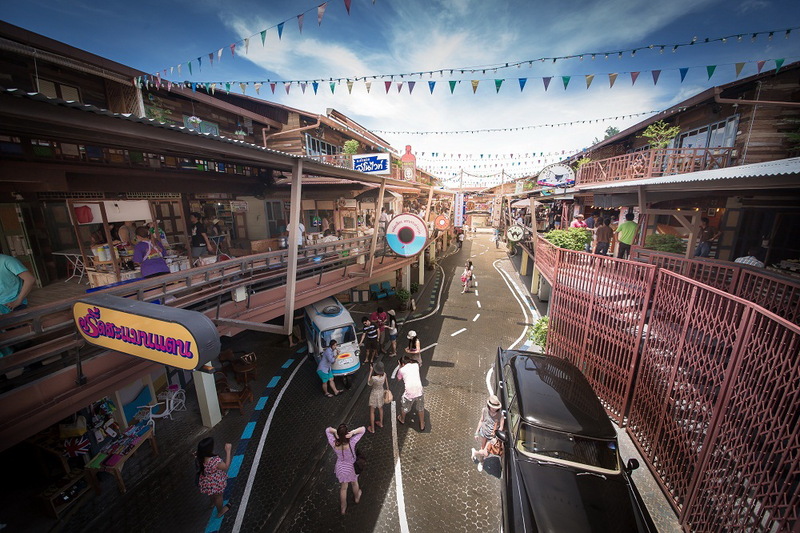 All in all, Cicada Market reflects Hua Hin’s laid-back yet vibrant personality. 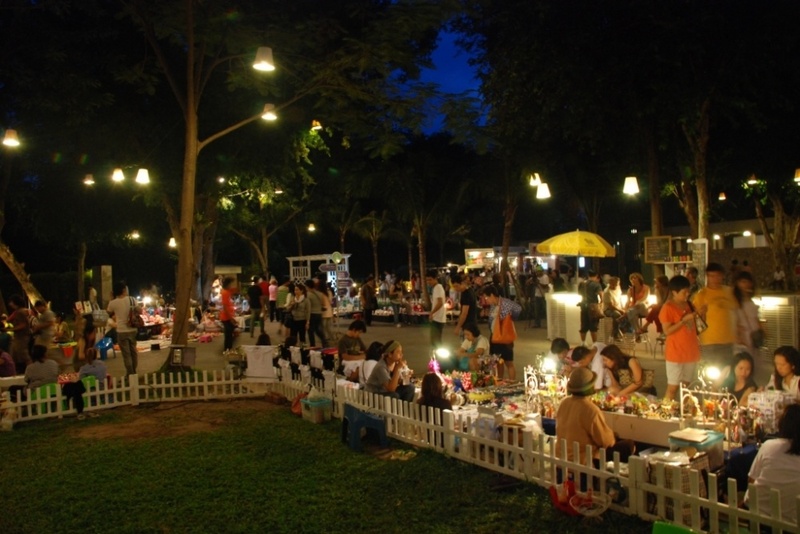 It’s not just another outdoor night market but a place where you can chill out, appreciate art and join in the fun. Highlights at Black Mountain Water Park Most of the park is open spaces, with little pockets of trees and greenery dotting the landscape. 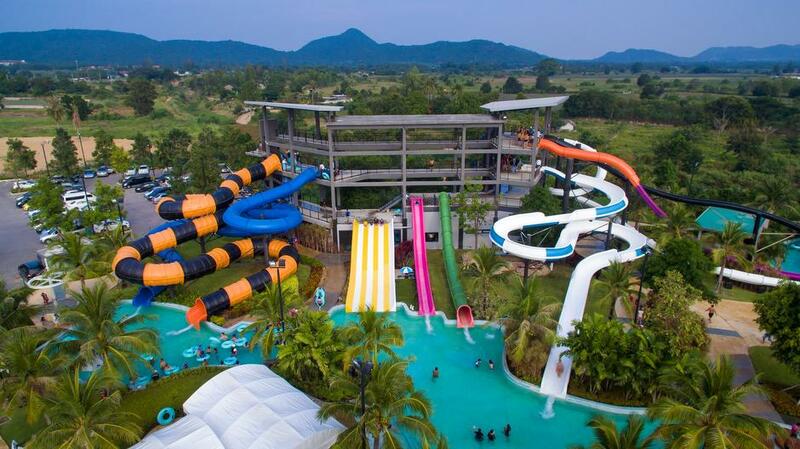 The nine water slides are grouped together, so you don’t have to walk very far to try them all. 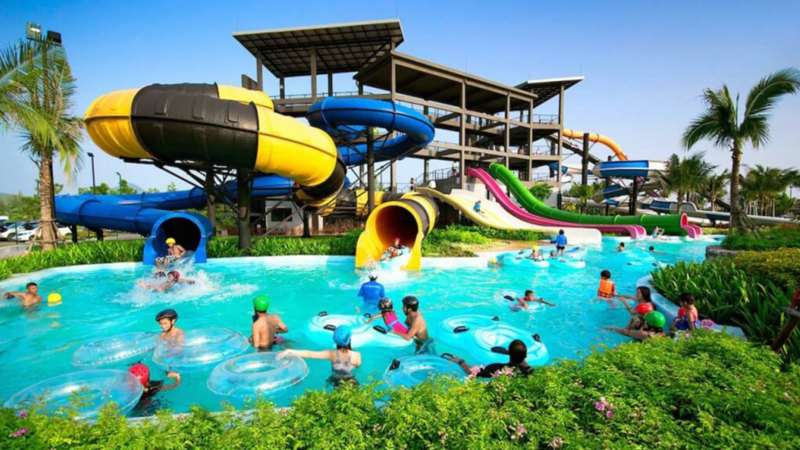 Some are built for speed, with long, narrow tubes that plunge straight down or in successions to the pool below, while others go round in circles before spitting you out in one big splash. 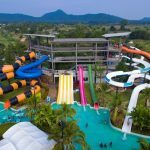 From the water slides, you get to the slide pool and lazy pool. Ride an inner tube, or just float, and simply go with the flow. The swim-up pool bar is ideal for quenching your thirst, while the spa pool and fountain pool offer a little break from all the adrenalin-packed activities. The wave pool sends out huge waves every 20 minutes, and the beach pool is, well, like a natural beachfront. 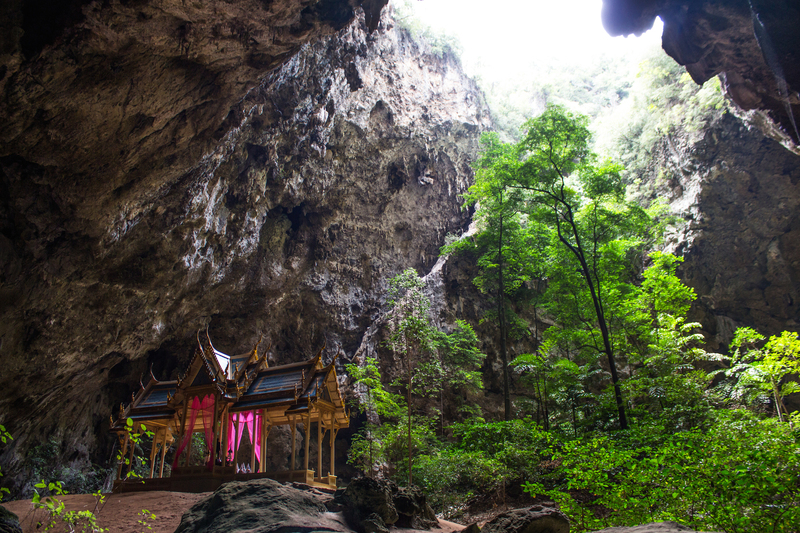 The area’s namesake also provides its biggest attractions, Khao Takiab Mountain delivers sensational panoramic views of the area as well as the rare experience of hanging out with gangs of monkeys. Generally the area is an incredibly scenic one, just walking promises great viewing of rural Thailand. 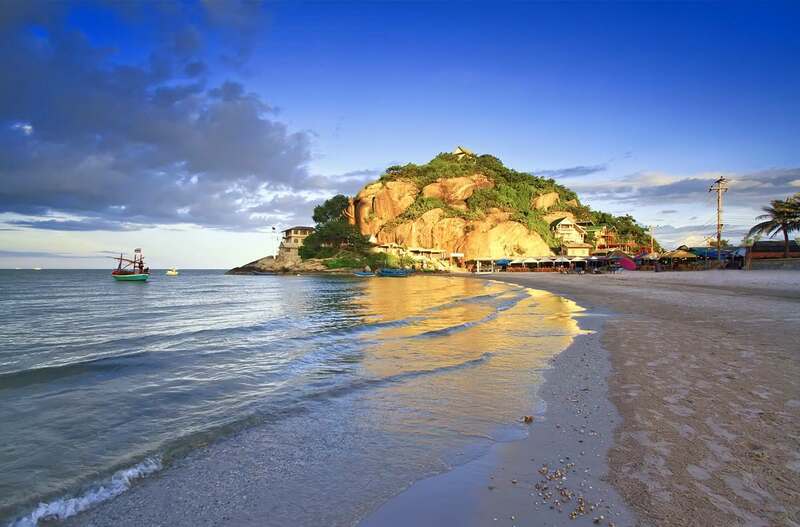 Take a stroll along Khao Takiab Bay were you can stop for lunch and admire the glistening ocean and water sport enthusiasts making the most of it. 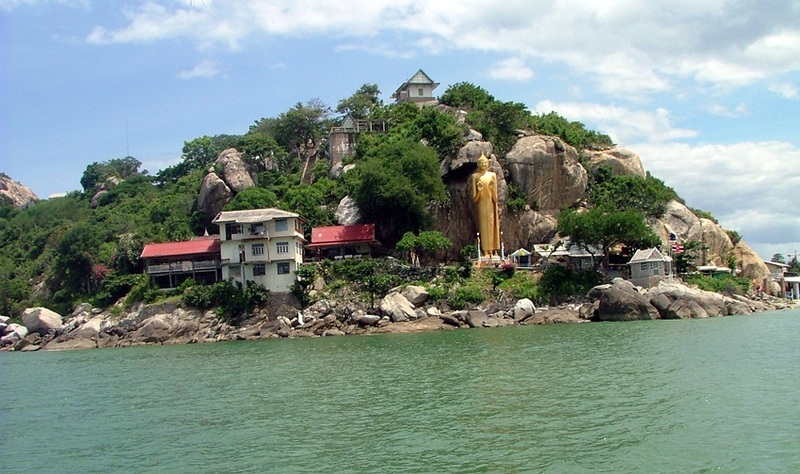 A few temples are within the area, the major one being Wat Huaymongkol, home to a statue of revered Buddhist monk, Luang Phor Thuad. 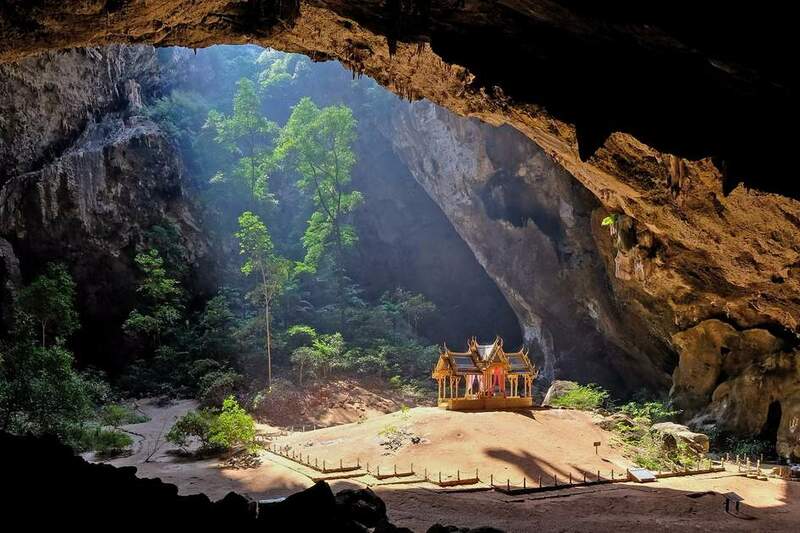 A short wooden path connects the two caves and finally it is there: since 1890, the Kuha Kharuehat pavilion stands gloriously in a ray of sunlight falling from a circular hole in the cave ceiling. If you are lucky to be the only visitor, the unusual silence adds to the majesty of the site… This pavilion stands on a hill surrounded by trees and vegetation. The pavilion was built at the end of the 19th century for the visit of King Chulalongkorn the Great (Rama V). Later, King Prajadhipok (Rama VII) and the present King of Thailand, King Bhumibol Adulyadej (Rama IX) also visited the cave. Once you have taken enough photos and your legs start to feel less shaky, it is time to go back. Walking down is less tiring in some way but beware of the slippery stones! Stop at the restaurant for some well needed refreshements or food. Note: We saw a very skinny dog in the cave, so if you read this, bring him a little something from your breakfast. We gave some money to the guides so they can buy some fried rice for the poor dog. Note also that the light is at it’s best before 11 am! 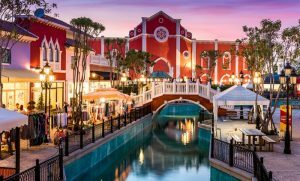 The Venezia is the newest theme shopping and attraction village in Hua Hin, following the growing popularity and undeniable success of other similar weekend destinations in Thailand. 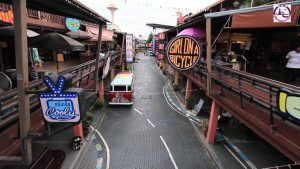 Palio in Kao Yai was probably one of the triggers for such epidemic frenzy for pretty villages, followed by the beautiful Santorini Park in Hua Hin and the now famous Asiatique in Bangkok. The concept of a shopping village is simple: instead of building a boring shopping plaza with rows of anonymous shops, pick a photogenic world destination or a fun theme, add plenty of romantic photo opportunities, plus a couple of attractions and entertainment venues, and there you have it: weekenders will flock to your village every weekend to play the romantic photographer and incidentally eat, shop, play and ultimately fulfill the real purpose of such a theme park: spend money. The theme chosen by The Venezia is obviously Venice and you will not miss the San Marco’s bell tower replica when driving through Cha Am on your way to Hua Hin. With 73,600 sq.m. and 316 shops, the park is immense and even includes a 200 meter ‘Grand Canal’ on which you can actually get a ride on iconic Venetian gondolas. Colorful mediterranean houses, shops and terraces are lined up on each side of the canal which ends in front of an Italian looking garden and two large church-like buildings: one is a Villa-Market (imported products supermarket) an the other a mini zoo. Another half of The Venizia is sheltered under an immense roof, and if you are too lazy to walk around this massive park you can always chose to do your shopping in the most unusual way: in a horse and cart. The theme chosen by The Venezia is obviously Venice and you will not miss the San Marco’s bell tower replica when driving through Cha Am on your way to Hua Hin. With 73,600 sq.m. and 316 shops, the park is immense and even includes a 200 meter ‘Grand Canal’ on which you can actually get a ride on iconic Venetian gondolas. Colorful mediterranean houses, shops and terraces are lined up on each side of the canal which ends in front of an Italian looking garden and two large church-like buildings: one is a Villa-Market (imported products supermarket) an the other a mini zoo. Another half of The Venizia is sheltered under an immense roof, and if you are too lazy to walk around this massive park you can always chose to do your shopping in the most unusual way: in a horse and cart. 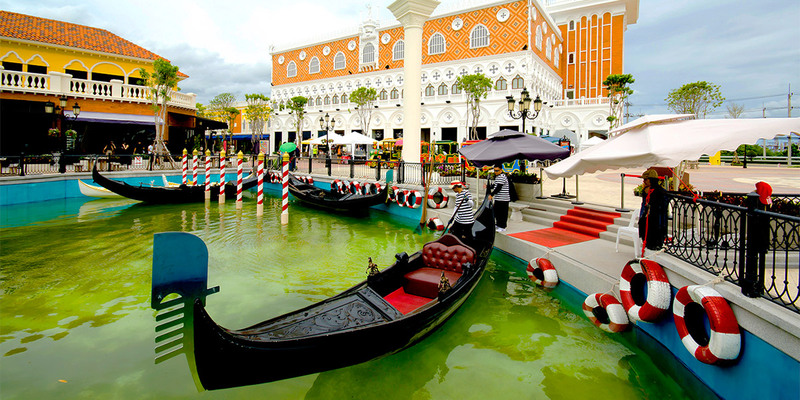 The Venezia features quite a few attractions: mini zoo and 3D museums now so popular in Thailand, but all require an extra fee to enjoy, even the small garden which appears to be nothing more than a photo playground. The several attractions available at the Venezia are sold together or separately and tickets are available at the entrance. 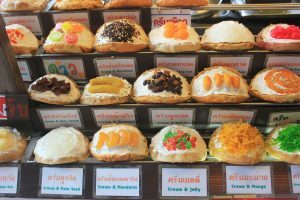 Prices at the time of our visit were as follows: Gondola ride or horse cart ride 160 baht, mini zoo 50 baht, mini train ride around the village 40 baht, 3D art Gallery 120 Baht, mini carousel 50 baht, ferris wheel 40 baht and the list goes on. 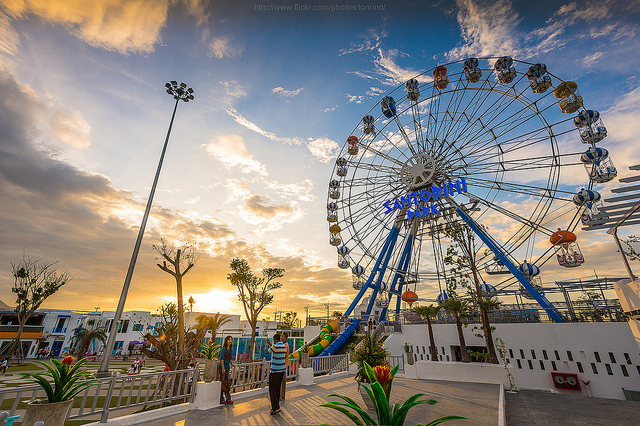 The five zones at Santorini Park provide all-encompassing entertainment. 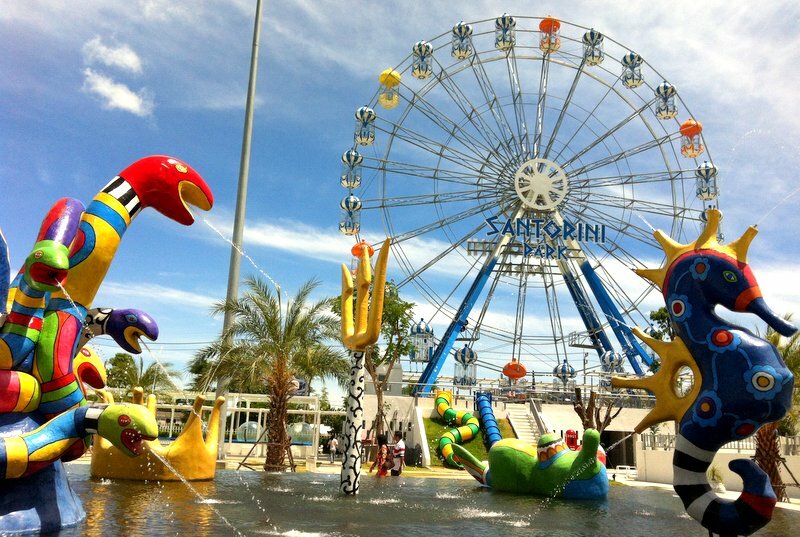 Park Zone is essentially the amusement park part, with rides and games set on vast landscaped grounds. 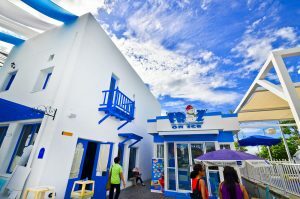 All rides are imported, including the 40-metre-high Ferris wheel, double-decker carousel, G-MAX reverse bungee, G-MAX giant swing, XD Dark Ride 7D interactive game and Asia’s first Wallholla climbing structure. 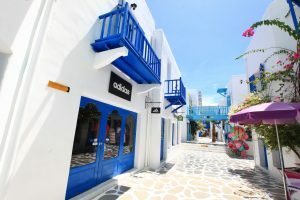 Village Zone is all about the Greek island’s village architecture and its chilled-out coastal vibe. 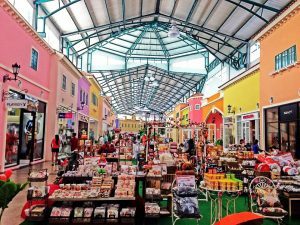 Wander down the maze of stone-paved lanes lined with two-storey whitewashed buildings and more than 140 shopping boutiques. 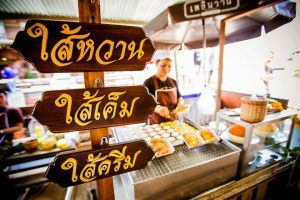 Rest Area is where you will find a host of fast food outlets, cafés, personal care salons, a petrol station, convenience stores and more souvenir shops. 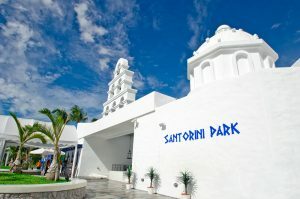 Santorini Park: Art and Culture Apart from shopping and entertainment, Santorini Park features an Activities Zone, a 3,000sqm outdoor space for hosting live concerts and performances. The Weekend Art Market features a flea-market style shopping experience. 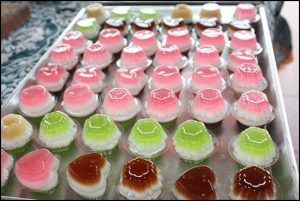 Find a wide selection of creative souvenirs and handicrafts to take home.